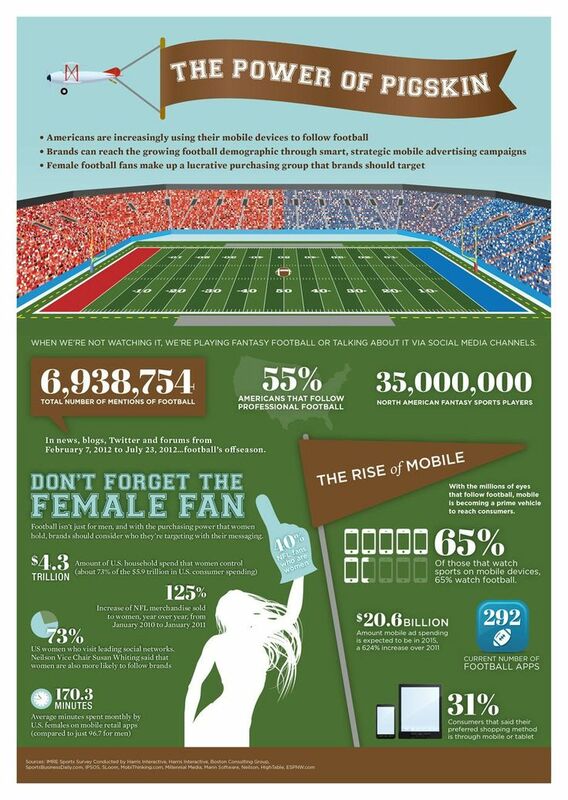 SurveyAnalytics Blog: Top 5 Infographics of the Week: Are You Ready For Some Football? Top 5 Infographics of the Week: Are You Ready For Some Football? With the preseason in full swing and the regular season just around the corner, there's no doubt that Americans are ready for some football. At Survey Analytics, many of us are Seattle Seahawks fans, some are Cincinnati Bengals fans, and we even have a few Ohio State/ University of Michigan fan rivalries. Whatever team you root for, whether it be for the NFL or a college team, we thought it would be fun to get into the football spirit by showing the top 5 infographics on football. While you're at it, check out our TURF Analysis Playbook webinar that aired earlier this week. It's a fun 30-minute presentation about TURF Analysis with a fun football theme and survey thrown in there. Enjoy! The combined value of the 32 NFL teams is equal to $37.4 billion, which is more than the national GDPs of more than 120 countries. The NFL's richest team is the Dallas Cowboys. NFL merchandise is a $3 billion per year industry. The most popular selling jerseys on the NFL shop were Colin Kaepernick, Russell Wilson, Robert Griffin III, Adrian Peterson, and Peyton Manning. Believe it or not, the NFL is a 501(c)(6) organization, meaning the league itself is tax-exempt. The individual teams do pay taxes, though. 5 NFL teams are responsible for 47% of all posted "likes" throughout the season. These are the Steelers, Cowboys, Packers, 49ers, and the Patriots. The most "liked" team on Facebook is the Dallas Cowboys, with over 7,241,906* (updated). The most vocal fans (most comments per page likes) are the Steelers, Cowboys, Eagles, Raiders and Jets. The most points to ever be scored during a game was between Washington and New York Giants. The score was 71-41, respectively. The most consecutive games lost was by Tampa Bay. They lost 26 games in a row. The top 5 playoff appearances by season are the New York Giants, Dallas Cowboys, Green Bay Packers, Pittsburgh Steelers, and the St. Louis Rams. Footballs were never made out of pig skin. Actually, pigskin refers to a crude soccer ball that was made from a pig's bladder. NFL footballs come from cowhide. It takes 3,000 cows to supply the leather for a one year supply of footballs for the NFL. During a regular NFL game, you are only going to see 11 minutes of actual playing, 17 minutes of replays and 67 minutes of players just standing there. Since 2000, every player to appear on the cover of the Madden NFL video game has suffered a season-altering injury or accident. 55% of Americans follow professional football. Of those that watch sports on mobile devices, 65% watch football. Don't forget about the female fan, either. 40% of NFL fans are women. The NFL store saw a 125% increase in merchandise sales from women year over year. There are over 35,000,000 North American fantasy football players.